(MENAFN - Daily Outlook Afghanistan) KABUL - President Mohammad Ashraf Ghani has opened the Afghanistan and China air corridor on Tuesday with the first cargo flight plane carrying 20 tonnes of pine nuts left Kabul for China. 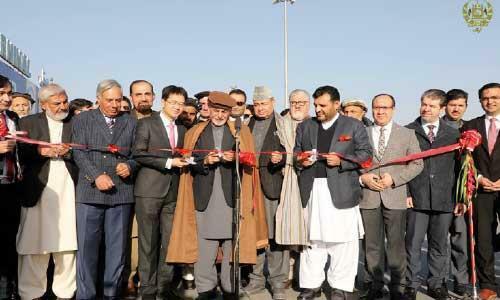 The inaugural ceremony took place at the Hamid Karzai International airport in capital Kabul. President Ghani said the Afghan agriculture products such as pine nuts and pistachio would be exported to other countries. By dispatching the first flight cargo of Pine nuts to China, President Ghani nominated 6th November as National Pine Nuts Day which should be celebrated nationwide in the future. According to Presidential Statement Afghanistan's pine nut production had been reached to 230, 00 metric per year and would be exported to the global markets under the Afghanistan label. The Afghan government had already opened air corridors with India, Kazakhstan, Turkey and Saudi Arabia during the ongoing year in order to help Afghan traders find access to global markets and increase the volume of exports. 'It was a great honor to see Afghanistan's pine nut exports to China today, Chinese consumers have been enjoying valuable goods from Afghanistan, and we expect more exports from this country in the future, said Wang Daxue, the deputy ambassador of China to Afghanistan during the opening ceremony of the air corridor between the two countries.